The 1991 men's soccer team, which went undefeated and won the national title. With 31 appearances, the Mercer County Community College (MCCC) men's soccer team has participated in more national tournaments than any other National Junior College Athletic Association (NJCAA) men's soccer program. It's quite fitting, then, that two of the six inductees into the NJCAA Men's Soccer Hall of Fame Class of 2018 are from Mercer. Selections were recently announced by the NJCAA's Men's Soccer Coaches Association. Inductee John Pietrowski, of Ewing, N.J., has been an assistant coach for the Vikings men’s soccer team since 1994. At the age of 83, he is still actively coaching. During his tenure at Mercer, the men’s soccer program has notched close to 400 victories, including 18 regional titles, 14 district titles, and 14 trips to the national tournament. At nationals, the Vikings have finished ten times in the top three in the country and won three national championships. (The team has won eight national titles since its start in 1961.) Pietrowski has worked with four head coaches including NJCAA Hall of Famers Charlie Inverso and Larry Povia. "John [Pietrowski] is a well-respected member of our program," MCCC Athletics Director John Simone said. "Due to his extensive knowledge of the sport, he is able to direct practices and make in-game decisions. He is a true expert when it comes to soccer strategy. They say you become an expert when you've put 10,000 hours into something, and John certainly has done that." Previously, Pietrowski was inducted into the MCCC Hall of Fame (2008), and, in 2014, was selected to the Hall of Fame at Northern Highlands Regional High School, where he coached for 27 years. 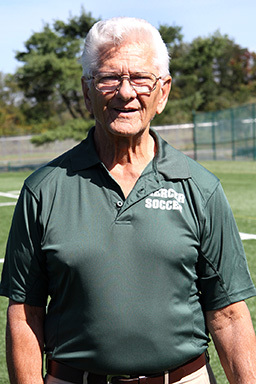 In 1989, he was named to the New Jersey Soccer Coaches Hall of Fame and, in 2000, to the Bergen County Boys Soccer Coaches Association Hall of Fame. For the first time in its history, the NJCAA Men's Soccer Hall of Fame is now including teams among its honorees. Mercer’s 1991 team is one of four undefeated national championship squads to be inducted this year. In 1991, Mercer defeated Yavapai College 1-0 for the national title, finishing the season with a record of 23-0-0. This marked the first time two teams were 22-0-0 entering a title match. The 1991 squad was led by Head Coach Charlie Inverso and was the fifth national title in the program's storied history, which dates back to 1961. 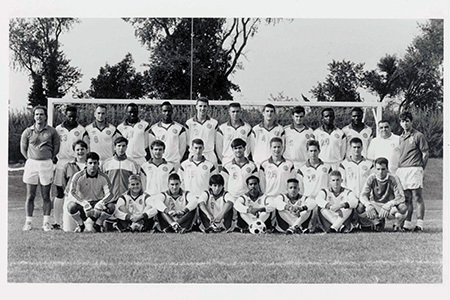 After its 1991 national title, the men’s soccer program went on to win three more national titles (1995, 1996, and 2004) for a total of eight.